In 1993, I quit my job as an associate pastor before my senior pastor could fire me. I hadn’t begun teaching heterodox doctrine or engaged in a sexual affair or some other moral failure. No, I had vociferously challenged the “seeker-sensitive” direction he was taking the church. As a 24-year-old seminary student, I felt I knew a lot more about ministry than my pastor did, and I wasn’t hesitant to download my “knowledge” on him. Needless to say, this frustrated him personally and hampered the church’s evangelistic ministry. At a tense lunch meeting, my pastor told me I needed to shape up or ship out, so I tendered my resignation and left. At the time, I thought my quitting was a matter of principle. I realized later, however, that it was really a manifestation of emotionally unhealthiness. I was young and immature but working in a missional environment that required a spiritual grownup. Several years of apprenticeship at a more traditional church, combined with two years’ work in corporate America, wised me up and mellowed me out. In 1999, I’m happy to say, I returned to work for the pastor who had wanted to fire me, and I count those years as some of the best of my career. “The emotionally unhealthy leader,” Peter Scazzero writes in his new book, “is someone who operates in a continuous state of emotional and spiritual deficit, lacking emotional maturity and a ‘being with God’ sufficient to sustain their ‘doing for God.’” That described me to a tee back then. I was thinking too much and feeling too little, reading too much and praying too little, reflecting on “big ideas” too much and relating to others too little. My life was out of balance, which meant my ministry was out of balance too. In The Emotionally Healthy Leader, Scazzero encourages pastors and other ministry leaders to take inventory of their inner and outer lives, to make sure they are operating in both areas out of a spiritual and emotional surplus. Jesus said, “the mouth speaks what the heart is full of” (Matt. 6:45), and that lesson is true for more than what we say. Our heart determines everything. What we do reflects who we are. Lead out of your marriage/singleness. Slow down for loving union. Your “shadow” is “the accumulation of untamed emotions, less-than-pure motives and thoughts that, while largely unconscious, strongly influence and shape your behaviors. It is the damaged but mostly hidden version of who you are.” Until your shadow is exposed to the light, it will undermine you, limit your service, and blind you to the shadow-side of others. That brings us to “Sabbath delight.” “Biblical Sabbath is a twenty-four-hour block of time in which we stop work, take rest, practice delight, and contemplate God.” I know of many pastors who preach about Sabbath rest—myself included. I know fewer who actually practice it, scheduling a regular weekly time of rest their ministerial labors. Is it any wonder that unrested ministers experience so much burnout? 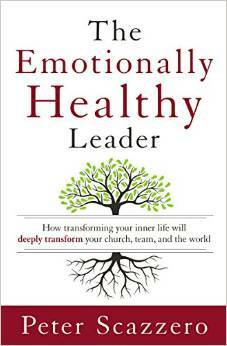 I benefited from reading The Emotionally Healthy Leader and recommend it to other Christian leaders, whether they serve as pastors, board members, or leading volunteers. It is well and winsomely written. It does not discuss everything that could to be said about the topic, as Scazzero himself concedes, but it tries to address the most important things with advice shaped by biblical wisdom, personal and pastoral experience, and psychological insight.